"For more than 6,000 years, the art of cutting hair has been practiced as a craft. In ancient Egypt, barbers trimmed the square cut beards of the Pharoahs. Today, they care for the square cuts on top of the head. Under the striped barber cloth, any customer becomes wrapped in some of the tradition that has surrounded barbers and their shops since the time of Plato. A barber shop is a combination of many things, old and new." I guess I never gave it much thought, but the barbershop is more or less becoming a thing of the past, a sort of old school industry with a rich history that in recent decades has been slowly eclipsed by traditional hair salons and the burgeoning wave of discount haircut shops that have sprung up in strip malls everywhere. The era of the swirling barber pole and a chatty male-dominated retreat where actually getting a little off the top was almost secondary to conversation and camaraderie has given way to quick, cheap and comparatively impersonal visits to an anonymous "stylist." In Barberland, directors A.D. Liano and Robert Liano spend an hour allowing the graying legion of neighborhood barbers to reminisce about their past and what awaits in the future, as well as a little bit of history, too. There's talk of stepping into the family business as teenagers, attending barber college, some nasty straight-razor shaving horror stories and the decades-long bond between customer and the man with the scissors. And these are the kind of guys you think of when you think of barbers, chatty local rascals with good barber names like Frank, Lou, Ralph, or Ray. They're the guys at the ready with an off-color joke or a bartender-like ear, building on that longstanding tradition of the male sanctity of the corner barbershop. In between the homespun anecdotes there's a look at hair singeing and a lengthy discourse on the nuances of cutting hair of varying racial types, the Liano's step inside the William Marvy Company, the last barber pole manufacturer in the United States, as well a truly strange Barber Shop Museum in Ohio (which thankfully gets a longer segment as part of the DVD extras). Dr. Mic Hunter, an author of a book on the vanishing barbershop, waxes poetic with the same kind of sentimentality usually reserved for talking about oldtime baseball players. The Liano's capture the last of a dying breed and just let them talk, because speculation is that in 25 years or so the old-fashioned barbershop is likely to become obsolete. There's a ton of great stories here—nothing particularly earth-shaking, but interesting nonetheless—and the men who cut the hair featured on this doc all have an easy, approachable demeanor that is probably as essential to their success as is their ability to actually use a pair of clippers. They're storytellers, and more importantly, good listeners. Image Transfer Review: It's not anamorphic, but it is widescreen. The transfer doesn't sport very bright colors—almost faded—but the levels remain consistent throughout. In short, it looks like a documentary. The print itself is relatively clean, as well. Audio Transfer Review: A neat and clean 2.0 stereo track is the sole audio choice, and for a documentary where 95% of the material is talking head interviews of barbers it more than passes the test. Voice quality is clear at all times, though some of the segments have a slight dose of hiss. Nothing fancy, but it works. Extras Review: No commentary or making-of, but there are a set of 12 deleted scenes and a bizarrely fascinating tour of the world's first barber museum, which runs just over 20 minutes. 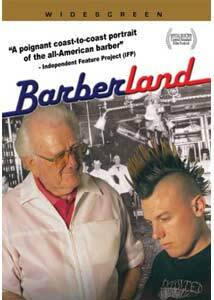 I love an oddball doc, and this one-hour look at the fading presence of the barber industry is full of good old day stories about what is truly a vanishing part of America. Maybe not an essential purchase considering the runtime, but documentary fans should warm up to this easily. Check it out.